Shuitin: Aprile 18, 2013, 10:48 p.m.
Firefecht an manhunt: Aprile 19, 2013, 12:30 a.m. – 8:42 p.m.
On Aprile 15, 2013, twa hamemade bombs detonatit 12 seiconts an 210 yards (190 m) apairt at 2:49 p.m., near the finish line o the annual Boston Marathon, killin three fowk an injuring several hunder ithers, includin 16 wha lost limbs. ↑ "He loved us, and we loved him". MIT. Retrieved April 11, 2015. ↑ 2.0 2.1 Straw, Joseph; Ford, Bev; McShane, Lawrence (April 17, 2013). "Police narrow in on two suspects in Boston Marathon bombings". The Daily News. New York. Retrieved May 15, 2013. ↑ Sherman, Pat (April 21, 2013). "UCSD professor says Boston Marathon was 'lone wolf' terrorism". La Jolla Light. Retrieved June 17, 2014. ↑ Ransom, Jan (May 28, 2015). "Death benefit given to family of officer wounded in Tsarnaev shootout". The Boston Globe. Retrieved May 28, 2015. ↑ 5.0 5.1 Kotz, Deborah (April 24, 2013). "Injury toll from Marathon bombs reduced to 264". The Boston Globe. Retrieved April 29, 2013. Boston public health officials said Tuesday that they have revised downward their estimate of the number of people injured in the Marathon attacks, to 264. ↑ Carter, Chelsea J.; Botelho, Gregory (April 20, 2013). "'Captured!!!' Boston police announce Marathon bombing suspect in custody". CNN. • a:"Richard H. Donohue Jr., 33,... was shot and wounded in the incident... Another 15 police officers were treated for minor injuries sustained during the explosions and shootout". ↑ Wilson, Scott (April 23, 2013). "Boston bombing suspect cites U.S. wars as motivation, officials say". The Washington Post. et al. Retrieved April 23, 2013. ↑ Cooper, Michael; Schmidt, Michael S.; Schmitt, Eric (April 23, 2013). "Boston Suspects Are Seen as Self-Taught and Fueled by Web". The New York Times. Retrieved April 11, 2015. 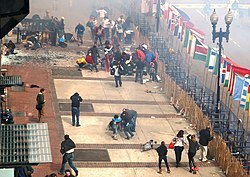 ↑ "What we know about the Boston bombing and its aftermath". CNN. April 19, 2013. Retrieved April 19, 2013. This page wis last eeditit on 13 Apryle 2017, at 21:12.